Genesis Art Workshops are a series of 12 intuitive art classes that work to develop your imagination and your perceptive skills in drawing nature, figures and landscapes. I am thrilled to announce the Guidebook is in the process of being translated into Hebrew. The basis of Genesis Art are 44 cards that work as a tool of self-transformation and artistic discovery. Most importantly they take the angst out of drawing and replace it with fun and excitement. Learn how to use the Genesis cards to launch, adjust and transform a simple work of art into something you would want to hang on your wall or give as a gift. Gesture drawings are quick sketches that capture a likeness with a pen or other wonderful art materials. 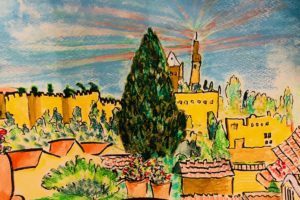 In Jerusalem, our subjects are endless as we gather in Yemin Moshe to draw people, especially children, enjoying themselves in the surrounding gardens. Learn techniques that you can enjoy using in many settings, indoors and out, on people you’ve never met before and on loved ones too! 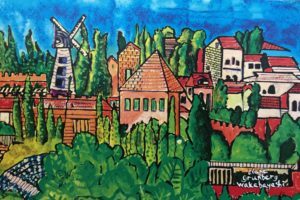 Outdoor drawing and indoor painting in the historic and flower-filled neighborhood centered around the beloved windmill of Yemin Moshe. Drawing flowers can be deceptively simple as you’ll discover Liane’s look/don’t look techniques for capturing flowers as they truly are. Learn to draw with your heart, to see without looking at the sketch paper, using easy yet powerful techniques to connect to artistic subjects and make them your own. Learn simple perspective drawing techniques that you will love. No previous art background is required. New Class to Begin in Mid-April! See the world through a new creative perspective by working from nature, your own intuition and the Genesis Cards. 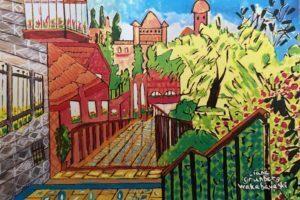 Each session you’ll be drawing, painting, getting inspiration from the beautiful gardens and stunning views surrounding Yemin Moshe. 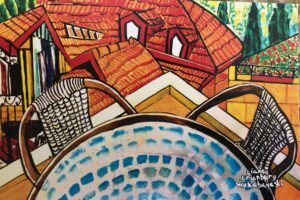 The studio is perched high on the Yemin Moshe stepped neighborhood with spectacular views of the walled old city, the windmill and beyond. Fine Swiss Neocolor crayons, paintbrushes, Japanese calligraphy pens, and fine European pastels are provided. Bring your own B4 (laptop size) sketchbook and your favorite supplies. *The Genesis Cards offer a way of illuminating your own art. A new perspective and depth of self-understanding is gained through intuitively looking at your art alongside a randomly chosen card. Special limited offer: Sign up for 4 Genesis Art Sessions (300 shekels) and get The Genesis Cards and Guidebook at half price 60 shekels (regularly 120 shekels).